What happens to the permissions from the original folders? Naturally, the folders in version 7 also act as the basis for the permissions. If a record was created in a folder, the record is granted with permissions in the same way as the permissions for the associated folder. 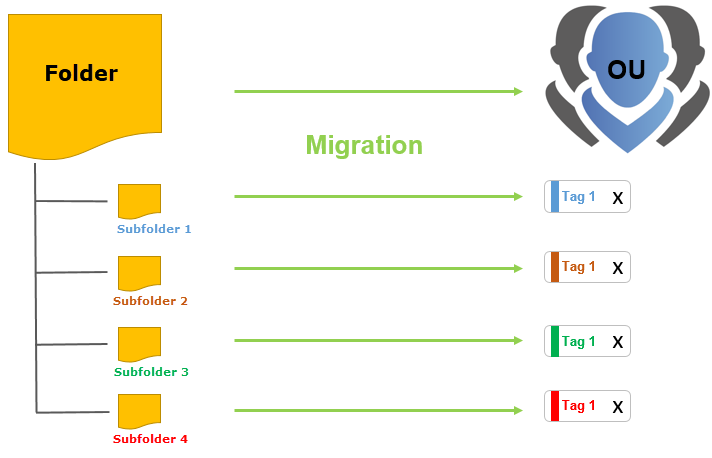 As long as only a few folders from version 7 are “mapped” into organisational units as part of the migration in version 8, this process does not change. A rights preset is automatically defined for the organisational unit (predefined rights) that is used to automatically grant the intended rights to records created in future. The subfolders had their own permissions. Due to the assignment of tags from subfolders, a new mechanism needs to be used because tags do not posses any rights. To enable a uniform system to be created, the rights template groups associated with the predefined rights can be helpful here.